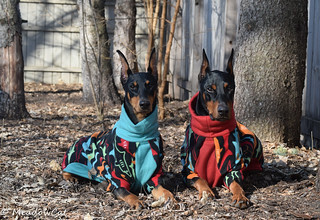 Doberman Forum : Doberman Breed Dog Forums > Doberman Specific Chat > Breeding and Breeders > Evahart Dobermans? Help! Has anyone heard of Evahart Dobermans in Redding, CA? I found her on AKC marketplace. She specializes in European Dobermans. I've been doing a ton of research and so far she seems trustworthy. I'm just a bit skeptical because she seems rather unknown in the breeding community. I haven't been able to find anything about her on this website or anywhere else. She posts her health test results on her website and I love the look of her dogs. What I'm confused about is: don't both parents of a litter have to be AKC registered for the puppies to be eligible for AKC registration? I was not able to find the sire nor the dam on the AKC online dog search. Is this because they're European imports? Can someone give me some more insight into this breeder/what you think? I am about to put a deposit down for a puppy. Welcome do DT! We're glad to have you. While I don't think this is a "bad" breeder a few things jump out at me that make me want to look elsewhere. For the upcoming litter the sire and dam have no health testing or titles listed on the site. While they do list some health testing on their site for other dogs it is lacking, especially that there are no yearly echo results listed- this is as important as the holter results for screening for DCM, and echos are generally more expensive (maybe why it's not done?). I see they are trying to show some in AKC conformation which is something, but you want there to be meaningful titles before breeding. It seems like another breeder that is importing dogs (some titled) from Europe, maybe to fit with current "Euro" market trends, and they are mostly looking to breed to sell pet puppies, rather than to preserve and improve the breed. If the latter is their actual goal, I'd want to see much much more. Rather than looking at the AKC marketplace, a much better place to find reputable breeders would be starting on the DPCA.org or UDC breeder directory. On the DPCA site you can also find chapter clubs through which you can meet local breeders and fanciers. Unfortunately as big as CA is, there is not a lot to choose from, so you may need to be looking to OR, WA, ID, & MT where there are many more. Hi mahn... And welcome from the Pacific NW. IMO... There are too many very good breeders in the region to take a leap of faith in a relatively unknown one. The breeder of our last 3 males is less than 3 hours from Redding just a few miles North of Grants Pass OR. Let me know if you would like their website address, facebook page or contact info. Again... Although I know nothing about Evahart and hence will not comment on the quality of their Dobes, personally, I would hesitate to pull the trigger on what could be a 10+ year commitment with out exploring all the possibilities. Last edited by 4x4bike ped; 01-31-2019 at 12:42 PM. Even though I'm not as active in Dobes as I have been in the past I still usually have at least heard of most active breeders on the west coast from BC, Canada, Washington, Oregon and Northern California. Evahart rings no bells--I've started asking around but this breeder seems to be pretty invisible.. I believe that in order for a litter to be registered with the AKC that both the sire and dam need to be AKC registered. And I thought there was some language about dogs registered with a foreign registry must be eligible for registration. Most (but not all) foreign registered dogs would be eleigible for AKC registration. But I'd want to know a lt of details about WHY the sire doesn't seem to be AKC registered. Is there a particular reason you want a "European" Doberman? I actually have one of her pups. She provided us with papers on both sire and dam. She does have great looking pups. I mean, that's expected? How recent was her last holter and echo on ANY of the breeding dogs she has? 2018, seems like. She keeps the Facebook group more well updated than her website by far.